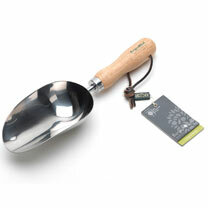 When you're planting, nothing beats this tool for speedy removal of compost from sacks - without spillage. The deeply dished head lets you pick up a generous measure with every load. The high back and sides of the head keep the compost in place. No more spills! The polished stainless steel finish is highly resistant to rust, leaving it looking beautiful for years to come. A sturdy leather hanging cord allows for tidy storage. 31cm length.